What would you do if your child faced a devastating life-threatening disease? What would you do to change her future? Annabel was born in September 2015. She was small, but perfect, and we fell in love with her immediately. Moments after her birth, however, she exhibited her first symptoms of AHC. We didn’t recognize her nystagmus, or abnormal eye movements, and dystonia, or uncontrolled muscle contractions, for neurological symptoms in the joy of the moment, but with the benefit of hindsight, her AHC symptoms are undeniable in the first videos we took. The immediate appearance of Annabel’s symptoms is troubling. We know now that the severity of phenotype for AHC patients often correlates with the onset of symptoms. This early onset of Annabel’s symptoms is troubling. 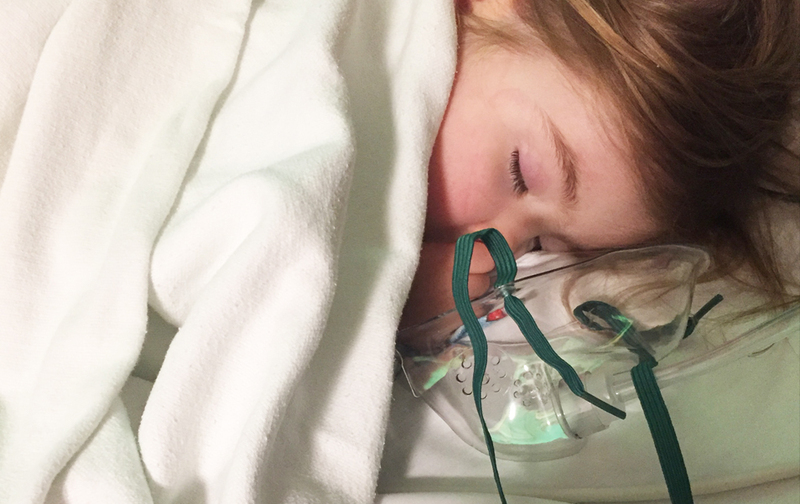 At Annabel’s two-month check up, she had a “seizure,” and we began her medical journey. After a series of inconclusive tests, Annabel was diagnosed with epilepsy. A misdiagnosis of epilepsy in young patients with AHC is common. Annabel was put on multiple anti-convulsant drugs used to treat epilepsy, which only made her more groggy and withdrawn and did nothing to address her symptoms. Her development lagged, with the gap widening at each new milestone. Annabel’s symptoms became more severe as she grew. Her “seizures” happened weekly, sometimes with many episodes of increasing severity in a single day. Her episodes were frightening, and were clearly not controlled. She spent days in the hospital, sometimes brought by ambulance after severe episodes. Other times, she was admitted to endure a barrage of testing. 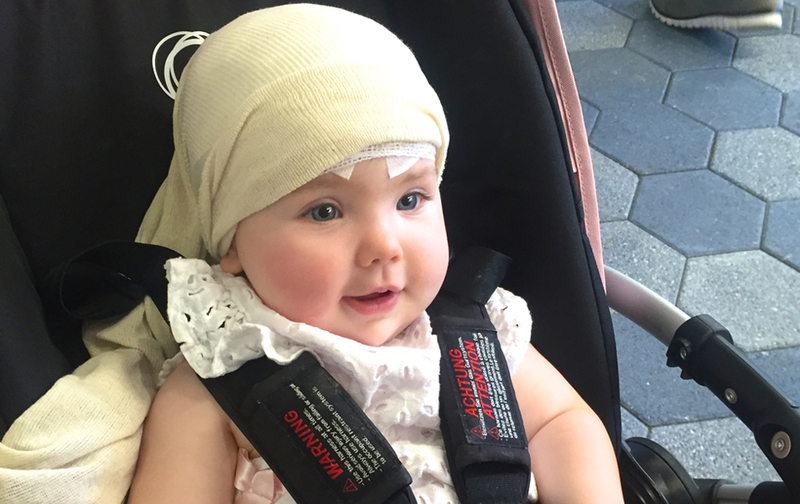 When Annabel was almost one, she began to experience hemiplegia. After a full week of paralysis on her right side, we feared she had suffered a stroke. But test after test showed no tell-tale signs of brain damage from stroke. Annabel’s condition was effectively a mystery, and we watched as she endured debilitating episodes and as her development progressed too slowly. When Annabel was approaching her second birthday, we finally found a correct diagnosis. Suddenly, Annabel’s symptoms made sense: they could be explained by AHC. As soon as we had a preliminary understanding of AHC, we knew we were on the right track. Genetic testing for a mutation in the ATP1A3 gene confirmed the diagnosis. Annabel was found to have a mutation in the ATP1A3 gene that substitutes an amino acid called leucine for another called proline at position 839 in the polypeptide chain that folds to form a vital protein called the “sodium-potassium pump”. This single substitution was found to be responsible for her devastating symptoms. Annabel began a new drug regimen with her new diagnosis, but her new medication cannot cure her or even fully address her symptoms. Annabel now typically has an AHC episode every four days. She requires immediate rescue medicine to cut short her symptoms. Annabel’s pattern of AHC episodes has become more regular, but her symptoms continue to evolve. At two and a half, she has also started to experience painful dystonia. Her leg muscles contract and she cannot walk or stand. 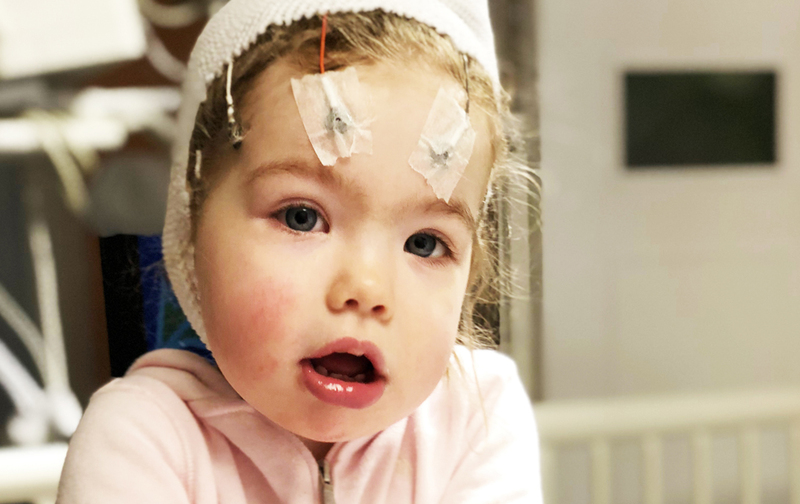 Even on her “good” days, Annabel now suffers from significant global delays, particularly in motor function and speech, but also in cognition. She has sessions with wonderful therapists 5 or 6 times a week. She has significant and dangerous difficulty swallowing related to her low tone, and she chokes uncontrollably many times a day. Despite her painful and disorienting symptoms, and her special needs, Annabel doesn’t let AHC rob her of her zest for life. Her symptoms were particularly severe on Easter, with a prolonged spell of reduced consciousness and distressing dystonia that lasted much of the day. Even though she could not walk or even crawl independently, Annabel joyfully hunted out Easter eggs and playfully tried to eat far more candy than she was allowed. This is her typical response to her episodes: she often continues to play, or giggle, or blow kisses even as she suffers from her symptoms. She faces her life bravely and joyfully–we want to give her the ability to keep fighting even harder. The future is uncertain for Annabel. In the near term, Annabel will attend preschool, accompanied by a nurse who can administer rescue medicine and attend to her needs. The long term remains a question mark. Outcomes are not usually good for AHC patients. Many AHC patients suffer a severe episode that causes permanent and catastrophic damage; many are unable to walk or talk again. Other AHC patients suffer long term “death” of cells in many parts of the brain. Still other AHC patients die prematurely, inexplicably, in early adulthood. Some patients have better outcomes: some have even married and or held jobs, despite their disabilities. We are not willing to wait and see which course Annabel’s life will take. 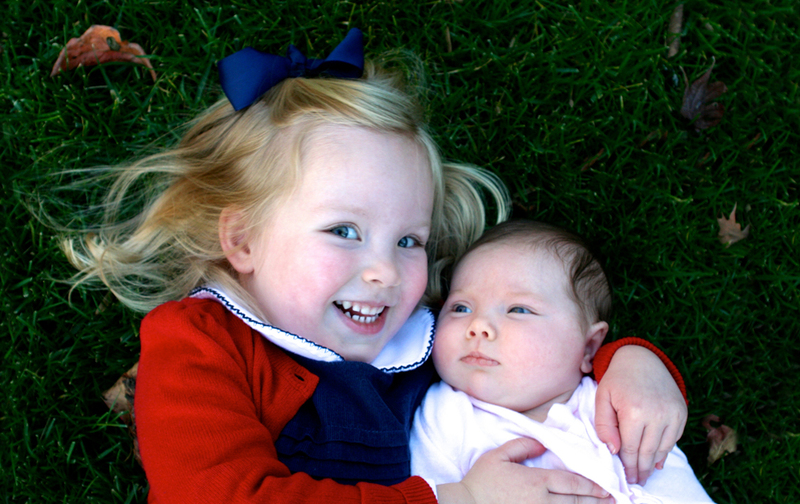 It is our mission to help Annabel have a full, happy, and healthy life. We want to cure her AHC.